Roger Williams sent these images, published by Wakefields of Brentford, which capture an exceptionally wet summer (sounds familiar). Note the many trees in the background, it could be a view of open countryside. 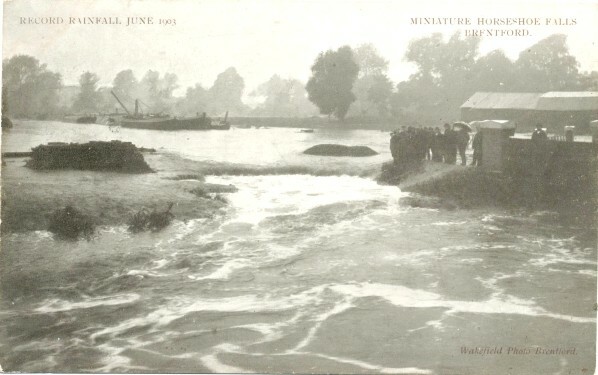 The first is titled 'Miniature Horseshoe Falls' and shows spectators clustered under umbrellas. It is taken from a vantage point to the left of the second image, some background buildings appear in both images. 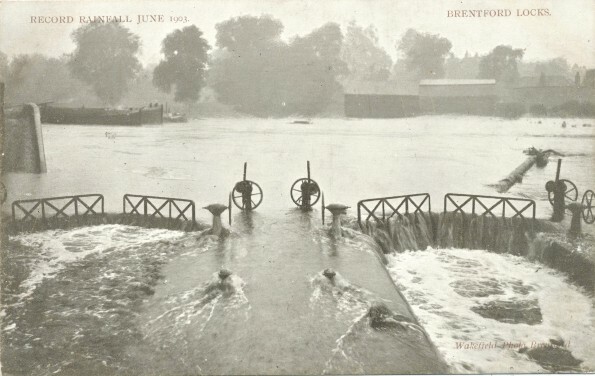 The second is titled 'Brentford Locks' and shows the two locks flooded: the view may have been taken from the footbridge over the canal, which is visible in a 1975 photo, to the left. I think a bridge is just visible to the right.